Our first item of ward business today is you need to click on The Office clip to your right. It will be well worth your time. My favorite part is when Andy does the little bird thing with his hands. I used to hate him but he is quickly becoming one of my favorite characters. You already know I am partial to Abba so this just made him all the more appealing to me. Well, maybe appealing is not the right word... but just watch it and see. Preheat oven to 350. Paper-line or grease 24 muffin cups. Blend cake mix, pumpkin, eggs, oil and water in large mixer bowl until moistened. Stir in chocolate chips. Spoon batter into prepared muffin cups. Bake 18-22 minutes. Let cool. Spread cupcakes with frosting and decorate! I have also made these in mini-loaf pans and they are great. So easy. Feel free to share your favorite recipe with me, or just show up on my doorstep with a sample. I promise I won't turn you away. And that about wraps it up for today. Anne Marie you are so funny I love the Office too! I was laughing so hard at that part!!!! 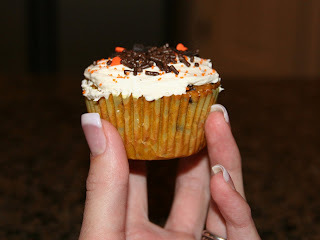 I am going to try your pumpkin cupcakes they sound so good!!!! Thanks for posting your recipe! The cupcakes look yummy. I will haveto try them. You always are making great things so post more recipes. I love the Office. It is defenitely my favorite show. I just hate that I have to wait a week between episodes. I'm so excited for the cupcake recipe. I will try to make them tonight...they look so good! The pumpkin cupcakes are SOOOO good. I will have to make some very soon. Also, that picture of Dallin H. is so cute! No wonder your first born is named Dallin. You are too cute!! Thanks for your sweet comment! I love the office, that part was so funny! And hey, why do your nails look so perfect? I'm going to try those cupcakes! Those cupcakes look good, but taste even better. Thank you! You are amazing!